Normally my figs ripen around the third week in September (Happy Birthday to me), but three weeks ago, when I saw this Bluejay mucking around in my tree, I knew something was up. The figs are ripening already, and as my Uncle Carl would say, “They’re sweet as sugar”. In my family, food was a big deal, but Figs were a really big deal. Before I was born, my Grandparents planted a fig tree in our yard. Figs are Mediterranean plants, and are not suited to the cold, often bitter Midwestern Winters, so every year, prior to the first frost , my Grandfather had to build a shelter around this tree in order to protect it. I was a little kid, but I remember this structure being built from scrap wood, and I think I even remember him straightening out used nails to assemble it (the scars of The Depression never heal). I believe he also filled this shed with dead leaves to provide insulation. The effort involved meant that the annual harvest became precious, maybe two or three Figs per person. Because I lived next door, and helped him with both the shed and the harvest, I think got an extra one. Something like this becomes such a large sensory memory that it becomes larger than life. My Grandmother sold that house in 1958 or ’59, but for us, that Fig, and the rituals that went with it became a mythic memory. Years later, one of her friends brought back a sapling from Italy. This particular tree had a tendency to send up shoots from its root system, and within a couple of seasons, Grandma gave my Mother one, and many years later, she gave me one. The fig in this photo is a descendent of that sapling from 40 years ago. There are two more good stories about this tree, but they are for another time. 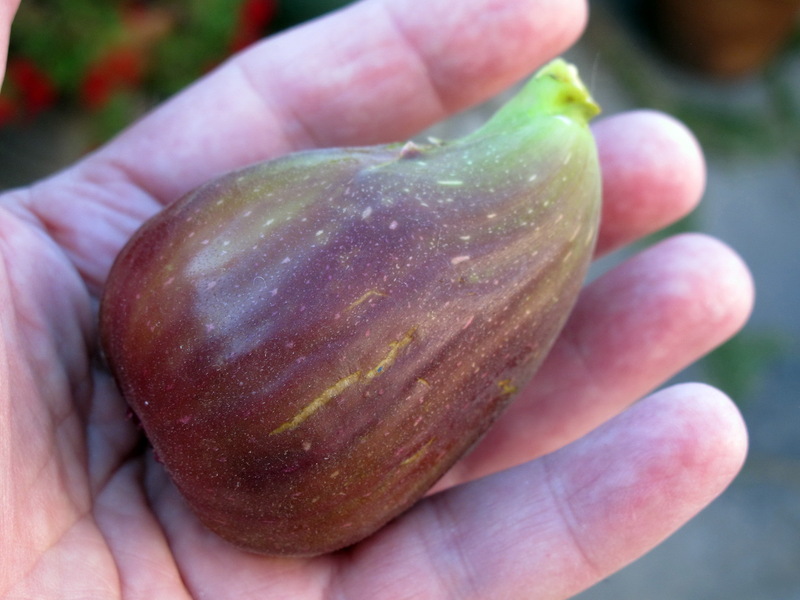 By the way, this is a Mediterranean Fig. Two other varieties of Fig are grown and marketed here in California, but they are quite different, and while tasty, they don’t push my same buttons. My Grandmother used to sprinkle sugar on a peeled orange because she said that the fruit in the United States just wasn’t as good as what she remembered in Sicily. It could be an acquired taste, or nostalgia could be the artificial sweetener at play here. Either way, these are some damn good figs-sweet as sugar. This entry was posted in Other Stuff and tagged Fig, Fruit, Italian on September 13, 2014 by Jimmy Reina. Like I said, I have a thing for Palm Trees. These buildings are part of the University of California at Berkeley, and these Palm Trees caught my eye every time I drove past them. I love the organic shapes of them against those griddy, rectangles. 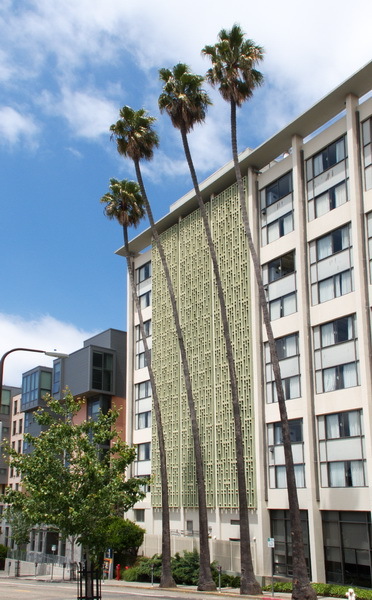 By the way, the green griddy patterned building has since been refaced to reflect the bland style of its surroundings. This entry was posted in Other Stuff and tagged Berkeley, four, Palm Trees, UC, University of California on September 2, 2014 by Jimmy Reina.